There is a very special message posted by the Executive Director of Alzheimers`Art Quilt Initiative (AAQI), Ami Simms, here. The message explains why 2013 will bring the AAQI to a close. If you follow my blog you will likely already be aware that I support this cause by making small art quilts for sale and auction. With an end in sight for AAQI, I need to step up to the plate and get to work if I hope to attain my goal of making enough quilts to raise $1,000.00 for them. So, like AAQI`s goal of raising $1,000,000.00 before they close their doors, I have my own goal in sight. 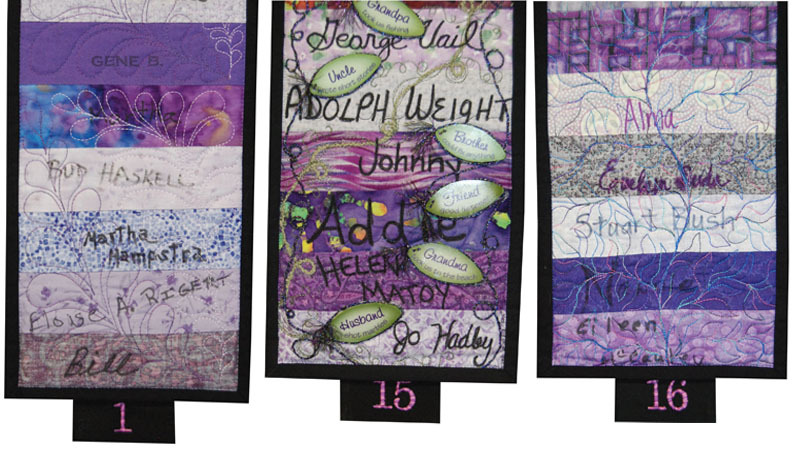 This month`s AAQI auction, starting Friday, features name quilts from the AAQI traveling exhibit "Alzheimer's Illustrated: From Heartbreak to Hope." You can read more about the exhibit here. It features 236 quilts. 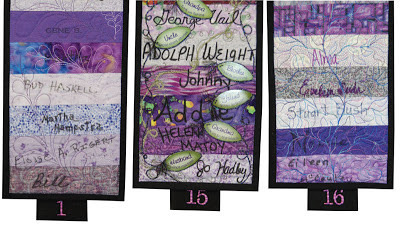 Long, narrow "Name Quilts" are made from 55 purple patches, each marked with the name of a person who has/had Alzheimer's disease or a related dementia. The "wrong" side of the fabric patches are showing. The color looks faded. The bright side of the cloth, full of the color and pattern of life, has been turned to the inside of the quilt, never to be seen again. The Name Quilts create a wall more than 10,000 names, representing and honoring the 5.4 million people in the United States who have this horrid disease. The other name quilts will be auctioned later this year. I have my eye on Quilt #87 when it comes up for bid because that is the one that holds my beloved Aunt Olive's name. If you have ever thought of buying a quilt to support AAQI, or of making and donating one to help the cause, do it now please! The end is in sight but it feels very good to have helped in this fight. Do it for a loved one or do it for yourself. Work in Progress - Finished Now! Well, here is Gerry's block finished at last. I continued on from where I left off in my last post by making the two main side petals. I covered the inside of these two petals with a double layer of glittered gold netting. Then I spent 8 hours (and then my fingers fell off and my eyes fell out, lol) couching Japan thread, first 8 rows in copper and then eight rows in silver. I used a tiny amount of gold trim for the stem of the flower and on either side I couched gold Japan thread with green cotton floss for the two leaves at the base of the flower. I changed the shape of the original center petal and used Kreinik metallic braids to satin stitch two more petals peeking from the back. There is a spider web at the top corner and the seams are done with gold braids and trims, embellished with a small amount of stitching in cotton floss. It will be on its way to Gerry in the mail tomorrow and I hope she likes it, especially after how patient she has been! Since I have not finished anything to show, I thought I would share a work in progress. This is another Jacobean style flower I am working on, in glitz and gold again. I cannot get the colours right on this photo so you will have to trust me that it looks all right. Here is now the first petal evolved. I had a friend drop by and give me some strange ribbon - it is like a netting made of metallic fibres melted together, gold on one side and silver on the other. I started by using two layers of this ribbon cut to shape to fit in the center of the petal. I used Kreinik braid to make a satin stitch border around the outside of the petal. Next I used a thick metallic thread, which I couched down the inside and outside of the satin stitch border. I used the Fyreworks to lay a grid of threads down across the inside of the petal. Lastly, at the intersections of the grid I applied cup shaped sequins with gold beads. I love the way the petal ended up and am now onto the next petal. 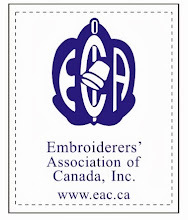 Treat yourself to some delicious eye candy by checking out The Embroiderers`Association of Canada`s online auction. The auction is up and running now and well worth checking to see the beautiful stitching up for bid. Below I am giving you a little sneak peek - for more you will have to check out the website here. 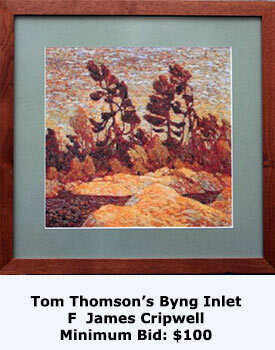 Wouldn`t it be great to own a piece of embroidery done by someone you have longed to take a class from? 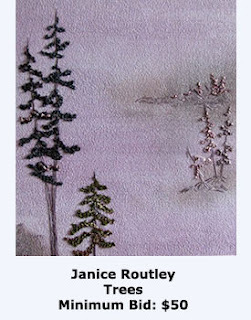 Janice Routley is teaching at Seminar 2013 in Winnipeg this year - I don't think anyone stitches nature like she does. Check out Seminar listings to see her piece, Trees of the North, and those of others teaching. There is still room in many of the classes and still time to register for Seminar! I had the privilege of meeting F James Cripwell in Saskatoon last year and what a fascinating gentleman he is! His work is nothing less than spectacular, even more so when you realize he graphs his designs himself, as he did with this one of a painting by one of the Group of Seven. To see this man's works in progress has you marvelling at his unusual technique. He works from the top down and every colour - and he uses hundreds in a piece! - is left hanging at the front of the piece until he needs it again. It makes sense once you realize you can't get yourself tangled when the threads are out there where you can see them. It looks pretty unorthodox to see this magnificent painting-like cross-stitch rising from a dense multicolour fringe of threads. James is definitely one of a kind and so are his works. Well, I don't pretend to be worthy of this company of stitchers but I do have a piece in the auction as well. This is a tea cozy I made from a round robin block I sent around. It is a generous size and will fit a large teapot comfortably. It is padded with several layers of thermal batting so is functional for its job. The fabrics are all upcycled bridal fabric and the bulk of the embellishments are gold in colour. 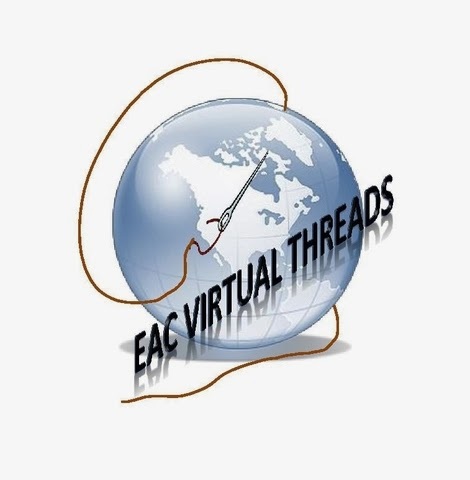 I have my fingers crossed it might raise a few dollars for EAC. Okay, off you go now and check out the auction! Happy Valentines Day to everyone! I hope you will have a wonderful day with the people in your life and celebrate your love for each other on this special day. What would be better to illustrate a post of Valentines' wishes than this beautiful heart shaped pincushion I received this week from my friend, Hideko. It was sent to cheer me up and it certainly did it's work well. All the embellishments are pinned and pinbeaded onto the pincushion so they could be removed and used elsewhere but I can't imagine them looking prettier anywhere than they do right now so I will leave them where they are. Thank you Hideko for your kind and thoughtful gift! A Bit of Stitching.... Finally! I finished up embellishing a block for Flora in the Fools Gold Round Robin and sent it off in the mail this last week so it is on it's way home. The main motif is meant to be a Jacobean style flower but looking at it now, I am not sure if it looks like one! lol I think I had tunnel vision while I was working on it and concentrated so much on each element I lost sight of it as a whole. In any case, it was fun to work with all the glitzy stuff for this block. If you enlarge the photo by clicking on it, you should be able to see some more of the details of the block.